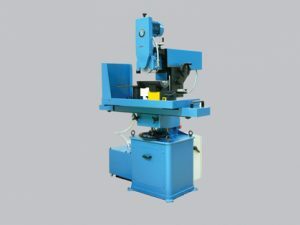 The Sonicam Joint Grinding Machine is a flat- and hollow grinder for grinding mould joints after repair. The machine is manual in order to allow taking away material only where necessary. The mould is positioned on a magnetic holder with V-blocks and can be adjusted in 2 directions to make sure that the joint is perfectly parallel with the table of the machine: the mould can be axially adjusted in the V-blocks with a gauge and mould & holder together can be longitudinally adjusted with a comparator. The hollow grinding is obtained with a copying device and a template at a scale of 10:1 for depth and 1:1 for length. The profile of the template is +/- 1 mm deep and can be made easily and accurately enough with a file. If you have further question about the product feel free to contact us.